As usual the derby started 1 week before the match. The supporters of Sampdoria made a pamphlet that they would take revanche for the 2 defeats last season: “all the arrogant Genoani in and outside the field should return depressively to their homes after the big lesson of Sampdoria at Saturday 28 November.” Of course we were all very frightened. 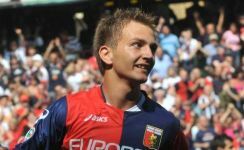 Also after the goal Genoa was the best team in the field and both Criscito (header on the crossbar) and Ziegler (shot the ball at his own post) were close to the 2nd goal. In the injury-time of the first half Giuseppe Biava got his second yellow card, so Sampdoria should start the 2nd half with 1 extra player in the field which gave them new hope unless the fact it was a miracle the score was still only 1-0. Also 10 Genoani still controlled the match and were several times close to the 2nd goal, but goalkeeper Castellazzi saved the others of Genova at the beginning. In the 53rd also Castellazzi was without any chance when Marco Rossi scored out of an assist of man of the match Omar Milanetto: 2-0. In the 66th minute even Sampdoria lost a player with a red card and the match was played, especially when Raffaele Palladino scored the 2nd penalty after Sokratis was fouled in the penaltyarea, again by unlucky Ziegler: 3-0. 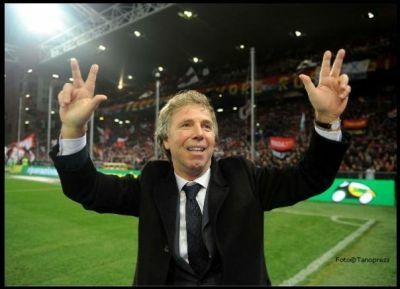 Both the Sampdoria players and fans reacted very frustated on the way of celebrating of Palladino. Especially Italian international and captain of Sampdoria Angelo Palombo lost his head and was saved by referee Rosetti who certainly had tot give him a red card. It was only a matter of time and the 2nd red card of Sampdoria arrived still when frustrated Cacciatore tried to break the legs of Ivan Juric. The numbers of the second half were clear: Genoa scored twice and Sampdoria lost 2 players with a red card. 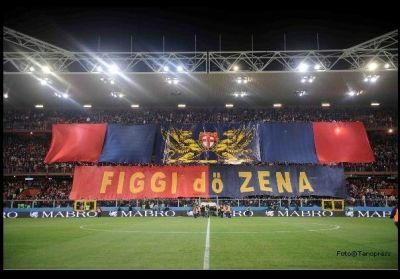 Genoa stays the boss in the city for at least another half a season. Grazie ragazzi, also without Diego Milito we are still the best in town !! 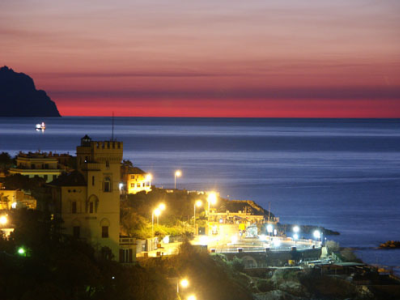 Saturday at 20.45 hours is the 101st edition of the lighthouse derby Genoa-Sampdoria. 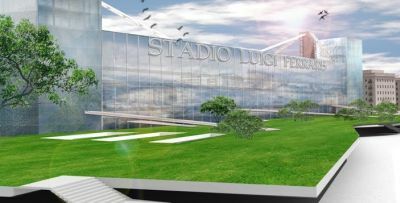 This time it is not only a match between the two teams and the supporters with their choreography but also the battle between the club (Genoa) that wants to reconstruct and stay in Luigi Ferraris and the club that wants to build a new stadium elsewhere in the city. Also in Holland it is possible to see the match. You can watch the derby, that was won twice by Genoa last year, at your own TV if you can receive Sport 1, while this sportschannel also gives everybody the possibility to watch the match live on internet (http://live.player.sport1.nl/) which costs you € 3,99. Of course it is as usual also possible to watch the match in the Satellite Sportscafé in the city-centre of Amsterdam (Leidseplein, next to famous Bulldog). 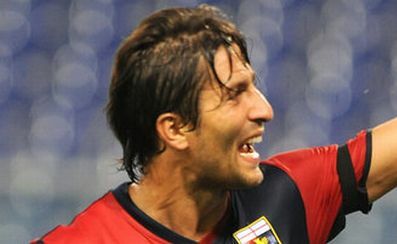 Genoa played one of the most bad matches of the season. We lost the match in midfield, usually our strongest sector in the field. Maybe the fact that we missed 3 of the 4 central midfieldplayers, only Zapater was available, was too much. Next week in the derby Omar Milanetto surely returns after his squalification, while probably also Ivan Juric can return after his injury. After goals of Lucarelli and Mimmo Criscito and a yellow card to Mesto which means that he can not play the derby, everybody thought the match would end in a draw, which also would be the correct endresult. In the last minute all our defenders only looked for Lucarelli, so Pulzetti was completely free to score the winning goal. In the last match before the National team break the Gasperini-boys again booked a spectacular victory with the deciding goal in the last minute. After Hernan Crespo scored 1-0 and 2-0 it was Raffaele Palladino (tonight after many years selected by Mr. Lippi in the Italian National team) who put 3-0 as halftime score in the books. Game over ? Unhappily not, because in the 80th and 82nd minute Siena scored 3-1 and 3-2, so everything was possible again also because of the fact many players of Genoa seemed tired after the match in Europa League last Thursday against Lille. 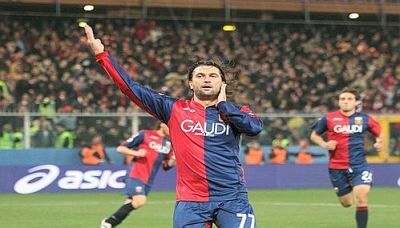 In the 90th minute the deciding goal was scored by substitute Sergio Floccari: 4-2 and again 3 points to Genoa. We are now on the 6th position in the standings with 20 points in 12 matches, exactly the same as last season when we ended at the fifth position and went into Europa League. 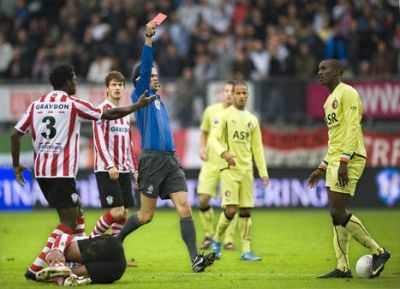 Was it the Dutch referee in the field ? The goals of Genoa-Lille were exactly equal with the match Genoa-Ajax 17 years ago, only this time Genoa in the role of Ajax. At halftime Genoa leaded by 1-0 thanks to the goal of Rodrigo Palacio (in April 1992 Ajax leaded by 1-0 thanks to Pettersson out of a cross of our member of honour Johnny van ‘t Schip). In the beginning of the 2nd half Hernan Crespo doubled the score (just like Bryan Roy in 1992) and at the moment you think the match is played Lille scored twice in only 8 minutes (as Aguilera did against Ajax) making the score 2-2. A draw did not help Genoa anything in the race to the next round so in the last minutes the Gasperini boys did everything to win. Just like Aron Winter in 1992 this time Giuseppe Sculli scored the deciding 3-2 in the last minute. 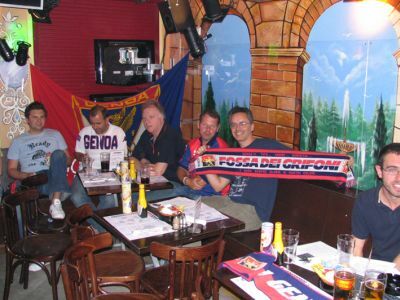 The first match of a lot of Dutch members of Genoa Club Amsterdam is finally played again with this time our Genoa as winner ! Because Valencia and Slavia draw in Praha (2-2 after Valencia leaded by 0-2), Lille is still on top of Group B with 7 points, Valencia and Genoa are both second with 6 points while Slavia Praha has only 2 points. 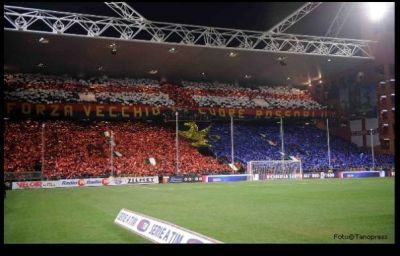 The next round is on Wednesday 2nd December when Genoa plays in Praha and Valencia plays in Spain against Lille.